The franchise quarter back could soon find himself surplus to requirements in New York. 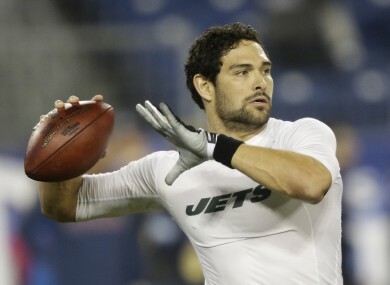 Jets QB Mark Sanchez could soon be looking for a new team. MARK SANCHEZ IS the former face of the franchise. He could soon be a former member of the New York Jets. The team will consider all their options regarding the beleaguered and benched quarterback in the offseason, a person with knowledge of the situation told The Associated Press on Thursday. The person, who requested anonymity because the team’s personnel plans are private, told the AP that the Jets have not made any determinations involving Sanchez. That means his status is in limbo and a trade cannot be ruled out. He’s not alone. The futures of Tim Tebow, coach Rex Ryan, general manager Mike Tannenbaum and offensive coordinator Tony Sparano with the Jets also are uncertain. Parting ways with Tebow, the immensely popular but little-used backup, appears a certainty after he came to New York amid lots of hype but had little impact in his one season with the Jets. But the Jets could be hard-pressed to trade or cut Sanchez, who is due $8.25 million in guarantees next season. “Anything dealing with the future past Buffalo (the regular-season finale) will be handled after that,” Ryan said Thursday. There are several complications that could lead to Sanchez actually sticking around in New York — whether it’s as a backup or starter. Sanchez, who received a contract extension in March, would cost the Jets a $17.1 million salary cap hit next season. They could, however, spread that amount over the next two seasons if he is cut after June 1. New York could also find it difficult to find a trading partner to unload Sanchez, who isn’t likely a very attractive option at the moment after turning the ball over 50 times since the start of last season. With Tannenbaum’s status unclear, teams might not be willing to even talk to him at this point about possible trades. Teams can’t make trades until March. If the Jets did wind up trading Sanchez, the salary cap hit would still be $8.9 million. The Daily News reported Thursday, according to sources, that the Jets would be interested in Michael Vick and that the Eagles quarterback would come to New York if it was clear he would be the starter. The newspaper also said Ryan “loves” Vick. “I’ll just focus on the players we have on this roster,” Ryan said while laughing. Sanchez, whom the Jets drafted fifth overall in 2009, was benched in favor of third-stringer Greg McElroy for at least the home finale Sunday against San Diego. Sanchez threw four interceptions and fumbled away the final offensive snap — and the Jets’ playoff chances — in New York’s 14-10 loss at Tennessee on Monday night. He once drew comparisons to Joe Namath after helping the Jets to consecutive AFC title games in his first two seasons, but his lack of improvement the last two years have caused him to fall out of favor. Ryan was non-committal Thursday when asked about Sanchez’s long-term future. Tebow was supposed to be the spark that got the offense going, but instead he spent most of his time on the sideline. His numbers are far from special: He has rushed for 102 yards on 32 carries and is 6 of 8 for 39 yards, and has a stunning zero touchdowns. Tebow repeatedly said he was “excited” to be a member of the Jets when he first came from Denver in a trade in March, and he reiterated that throughout the season. But he acknowledged that he was “a little bit disappointed” that Ryan chose McElroy to start over him — at least for Sunday. Now, Tebow could be an ex-Jet less than a year after he came to New York with lots of expectations. What’s eating rugby writer Stephen Jones, Munster fans? Email “Jets will consider options with Sanchez”. Feedback on “Jets will consider options with Sanchez”.